If a doctor behaves in such a way so as to undermine clearly the medical profession, he could be suspended or struck off at worst by the General Medical Council on the grounds of not “working collaboratively with colleagues” under the code of conduct, “Good medical practice” (domain 3). The particular subsection is rule 35, “You must work collaboratively with colleagues, respecting their skills and contributions.” June Andrews’ suggestion is offensive as it pits people against professionals in primary care, who are doing their best to practise medicine given the resources available to them. I strongly commend to you the reply by Dr Margaret McCartney. There are about a hundred different types of dementia, not all presenting with memory problems (though Alzheimer’s disease, typified by problems in short-term learning and memory, in the beginning, is the most common type of dementia globally). Therefore, somebody may present with symptoms which are not easily recognised as a dementia. In the younger age group, the behavioural changes in frontotemporal dementia may be misdiagnosed, with no malintent, as depression or anxiety simply. The issue that McCartney raises is a very important one. And yet it is reported that Andrews has had difficulty in discussing issues with professional colleagues in a sensible manner. Prof Sube Banerjee emphasised in a recent meeting of the King’s Fund, “Leading change in dementia diagnosis and support”, that dementia diagnoses in primary care had to be of correct quality, and professionals in primary care needed support in making these diagnoses. Banerjee further emphasised the considerable damage which might be done in given an incorrect diagnosis of dementia, to someone who did not have dementia. This has always been a risk with incentivising financially making the diagnosis of dementia as others have correctly pointed out, such as Dr Martin Brunet. It might be that the symptoms do not progress and do not warrant a diagnosis of dementia in severity. The majority of such people with the diagnosis of “minimal cognitive impairment” do not progress to a full blown dementia, and such patients need to be monitored carefully with time. “The most compelling papers that concluded most MCI patients will never develop dementia include what are called “meta-analyses”, that is, they combined and reanalyzed the results from a number of different studies that the researchers considered to meet criteria for being well-designed and -executed. I have previously blogged myself on how the Wilson and Jungner WHO screening criteria may include case-finding, but the National Screening Committee, as McCartney points out, has consistently advised against screening in dementia for a number of years now (and last upheld in January 2015). The actual issues concerning when patients of the NHS decide to seek help over symptoms of dementia are complicated, and have often been investigated methodically. Such issues indicate the national ‘diagnosis gap’ for dementia is not simply due to General Practitioners ‘under-performing’. All this raises the question of what the legal claim Andrews has in mind. As such, there is no direct contract between patient and doctor in primary care, for which the contractual term is that the doctor must make an accurate diagnosis of dementia immediately; such a claim would therefore be ‘breach of contract’. The claim, in the alternative, could be in the law of tort for breach of duty of care; this is ‘clinical negligence’. Such claims would have to satisfy the “Bolam” and “Bolitho” tests. They mostly would not, one might reasonably anticipate. In an unlikely case that a claim might be upheld, the civil procedure rules for litigation state clearly that the claimant must pursue other dispute resolution means first. This is according to the “pre action protocols” clearly stated under English law. And how is the patient meant to fund such a claim? It has been widely reported that there has been no legal aid for medical negligence claims since April 2013. This is pursuant to the Government’s legislation the “Legal aid and sentencing and punishment of offenders Act“. In summary, Prof Andrews’ remark is neither held out by the standards of the legal or medical professions, and arguably should not have been made in a position of power. All political ideologies, ranging from Edmund Burke or E.P. Thompson, do not condone abuse of power. Burke famously said, “The greater the power, the more dangerous the abuse.” It would thus be helpful if Andrews could withdraw her offensive remark, assuming the LRB have printed her letter correctly. 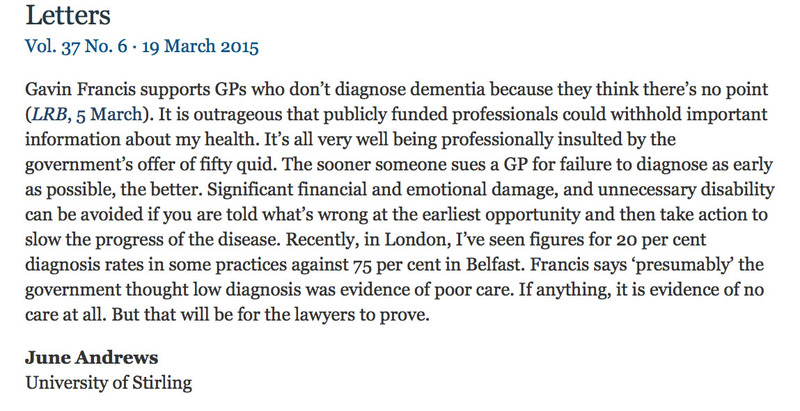 Legal/ethical arguments notwithstanding, a GP’s inability or unwillingness to identify the signs of dementia has serious, and possibly damaging consequences. My wife has been habitually absent-minded about the small things in life, but around 2010 there were new behaviours: often-repeated questions, occasional disorientation. Her father had dementia in his latter years, and I was concerned. I persuaded her to talk to her GP. But there was ‘no problem’, she cheerfully reported after the appointment. A couple of years later, in a new location, things had turned for the worse. She was unable to take in new information, struggled to use the computer, and this time I wanted to see the GP too, to make sure the symptoms were accurately described. I left the surgery feeling I had betrayed my wife, who ‘didn’t seem to see things the same way’ as I did. Yes, the doctor would run a few quick tests – I didn’t need to be around – but it was unlikely to be dementia … she was ‘too young’. 2013 and things were serious. We’d moved again – and in a new town, my wife was unable to get her bearings at all. She was lost even walking around the block to the shop. Gadgets – like the gas-cooker – were alien objects. She couldn’t count money. But, chastened by the earlier experience, I was reluctant to haul her in front of a GP again, and wouldn’t have done so if it hadn’t been necessary to register as new patients. Fortunately our new GP saw the problem immediately. Tests, then a scan, and the consultant announced it: early-onset Alzheimers. Do I wish dementia had been diagnosed three years earlier? Yes. Early detection may not have slowed Alzheimers down, but my wife could more easily have come to terms with it if it had been explained while she was still in a position to understand. We could have taken earlier steps to fight back – as we are, belatedly, now. And I would have been spared 3 years of guilt. Do I wish to sue or seek compensation? No. What good would that do? Do I wish that no other person in the early stages of dementia had to suffer from professional incompetence? Absolutely. Our political and social convictions – the determination to change the world for the better – sometimes lead us to make rash assertions in support of our case. Professor Andrews may not have made her point well, but she had a point to make. Thank you for explaining the “legal illiteracy” of Professor June Andrews suggestion that GPs should be sued for failing to diagnose as early as possible (as published in the London Review of Books). Over many years I have reasoned with Professor June Andrews, sharing evidence and ethics, why I think a timely approach is a better way. I very much fear that the approach Professor Andrews continues to advocate risks causing considerable harm, particularly as it ignores both the complexity of life and of biology. I fear that stigma may worsen as a result of Professor Andrews intervention. My lost comment in the PULSE correspondence on this matter was to say that I did not agree with Professor Andrews that her arguments, and in this case an explicit suggestion to sue, were “logical”. This may be what you mean by “medical illiteracy”. At the end of your post you suggest “It would thus be helpful if Andrews could withdraw her offensive remark, assuming the LRB have printed her letter correctly.” In fact Professor Andrews has, it seems, since then reaffirmed her position. (1) In this publication, “FOUR NATIONAL APPROACHES TO DEMENTIA – NOT JUST ONE”, it seems to me that Professor Andrews is content not just to split doctors from nurses (and vice-verca) but also one nation from another. Across the UK, and indeed beyond,Professor June Andrews is a most influential figure in dementia. I personally worry very much about Professor Andrews approach to this complicated subject. The need for timely diagnosis is not in dispute, the medical and nursing professions unanimously agree, but suing somebody at the first juncture is not the correct solution, many believe. There are genuine issues about why dementia may not be picked up by both primary care and ‘experts’ in secondary care, and these certainly need addressing; the low hanging fruit point might be to say GPs are sitting on legitimate diagnoses, or not up to the job, but GPs are very tightly regulated – doctors need to say if they feel their training needs are not being addressed, particularly since politicians are tending to big up the quality of the dementia service in England. GPs are working at full capacity with tricky funding pressures for them; and there’s also the issue that the time at which they see a presentation of dementia GPs are seeing a very different picture to what ultimately emerges (and therefore a lack of diagnosis has to be valid at the time at which the GP saw them, not subsequently). The macho doctors vs nurses language is not helping in professional relations, furthermore. I don’t feel June, who is a lovely person, is acting well by blocking people on Twitter who are GPs who want a legitimate and reasoned discussion with her. I really appreciate both of you comments.